A few people have asked how/when I met Gene and it's too good of a story to bury in a long trip recap. So sit back, grab a pint (of whatever) and enjoy learning how I came to meet one of my most favorite people in this world. (My oldest sister) Kara and I decided to spend my spring break in Ireland. I was so excited to go as I had been raised to believe that being of Irish ancestry was the most important thing about myself. 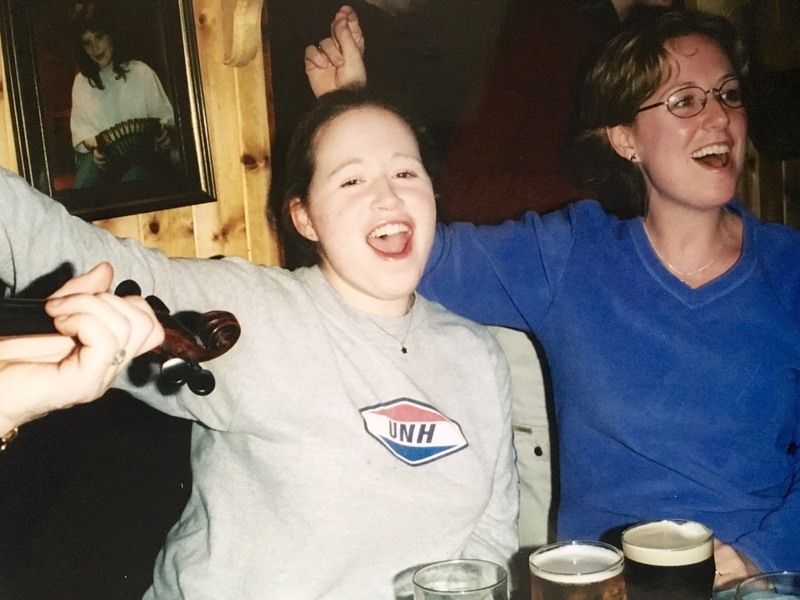 Kara and one of her best friends, Kelly, backpacked through Europe upon finishing college, so she planned the trip and did so around two things: first- getting to see her friend Jen, who she met while working on the Jersey Shore. (This waaaay pre-dated the reality T.V. show, FYI.) And second- seeing the Cliffs of Moher. When Kara had last been, they had been fogged in and she never got to see them since visibility was so poor. For this trip, if I remember correctly, Kara did all the planning and I essentially just showed up and drove us around the country when we weren't in Dublin. While waiting, we chatted with the two men sitting next to us: Gene and ?arry (I didn't know if his name was Harry or Larry, so I just called him Arry all night. Turns out his name was Harry). They were longtime friends who were playing golf nearby in Lahinch. Gene owned a pub that he invited us to. After we happily accepted the invitation, we learned that the pub was three hours in the opposite direction of where we were going. My response was something along the lines of "We're American. Every inch of this trip is already planned and we can't deviate." Gene still tried to talk us into going, but I knew in my heart that it just wasn't going to happen. We continued the conversation for a couple more hours until it came time for music and they couldn't find the local musician. Gene, as it turns out, was well-known by the pub owners and was asked if he'd stand in for the musician, Kevin, that had gone missing. Before we knew it, Gene returned with a handful of instruments and became the nightly entertainment. Kara and I had the time of our lives. At Gene's urging, we sat down next to where he was playing music and had a front row seat to one of the most magical nights of our lives. For over two hours, Gene played song after song, switching instruments and engaging the crowd by asking them to sing songs from where they were from. Below you can see Kara and I singing Frank Sinatra's "New York, New York." Gene looks skeptical...who can blame him? Happily belting out "New York, New York"
The invite we received from Gene to come to Andersons Thatch Pub. My favorite part = "Ladies Very Welcome". We had a wonderful and magical night. It was so much fun and I felt like we had hit the jackpot in meeting Gene and getting to talk with him and Harry. And then to be in the thick of the music was such a fun experience. In looking back at my journal from this night, here's what I had to say: "It was, as Kara put it, a totally authentic Irish night. 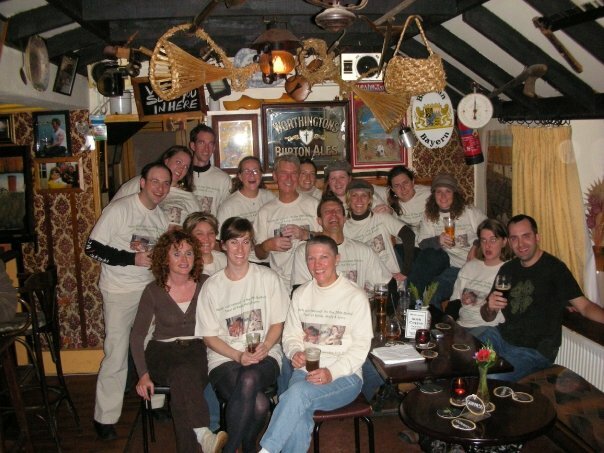 We got pissed in an Irish pub in a small town with the locals. Listened to some wonderful music. Drank a lot of beer. Took great pictures. Met people from all over the world. I was so happy. I was also so completely trashed. I thought Doolin was great. I had one of the funnest nights ever. And I can't wait to get the pictures back. Gene was absolutely adorable. 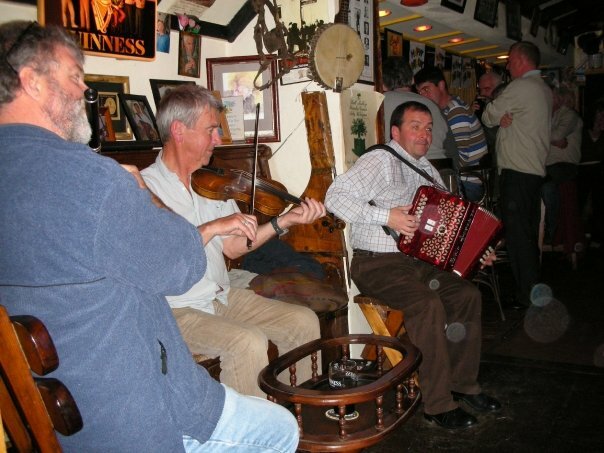 I just had a fabulous time at McGann's and was definitely sad when it was time to leave." I'd like to say that I knew this was the start of something really special. But I didn't. I had no clue how much this chance encounter would change and enhance my life over the course of the next 16+ years. 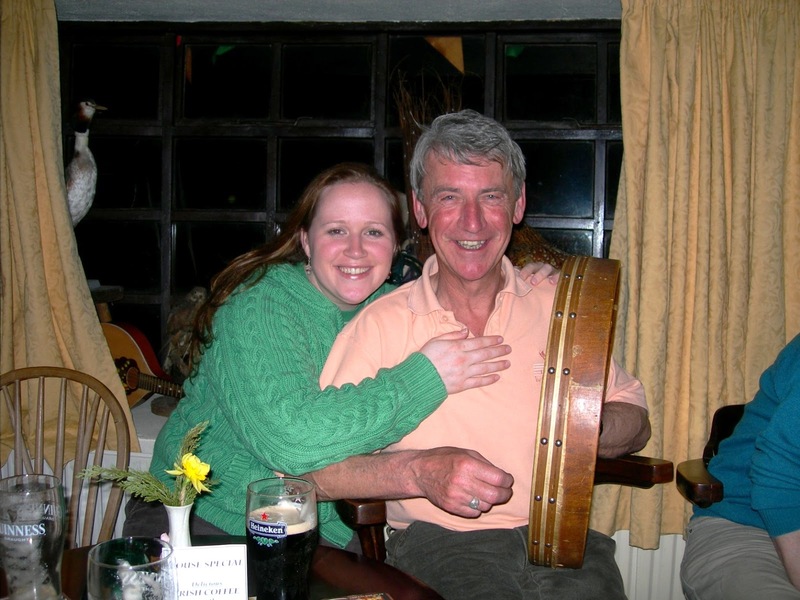 A couple of weeks after our St. Patrick's Day Wedding, Steve and I headed to Ireland for our honeymoon. We had specific plans of where we wanted to go and what we wanted to see. But one thing I knew for sure was that we were going to hit up Anderson's Thatch Pub on the only Wednesday night we were going to be in the country. Our honeymoon got off to a rough start. Like a really rough start. Our luggage arrived one full day after we did. Steve got food poisoning the second we got off the plane (even after all these years, I maintain that's what you get for eating an egg salad wrap on the airplane) and was getting sick for hours. When he wasn't getting sick, he was sleeping, resting or taking it easy. I had to talk myself out of "this can't be a good sign for the marriage" kind of thoughts that were swarming through my head constantly. After the luggage arrived and the food poisoning went away (for a few days at least! ), I could focus on having a good time. My expectations were high for our Wednesday night plans. Remembering what Gene shared six years earlier, I knew that was the night to go to his pub. Our honeymoon plans were made around being in Carrick-on-Shannon that Wednesday night. We showed up, unannounced, at 9:00 p.m. 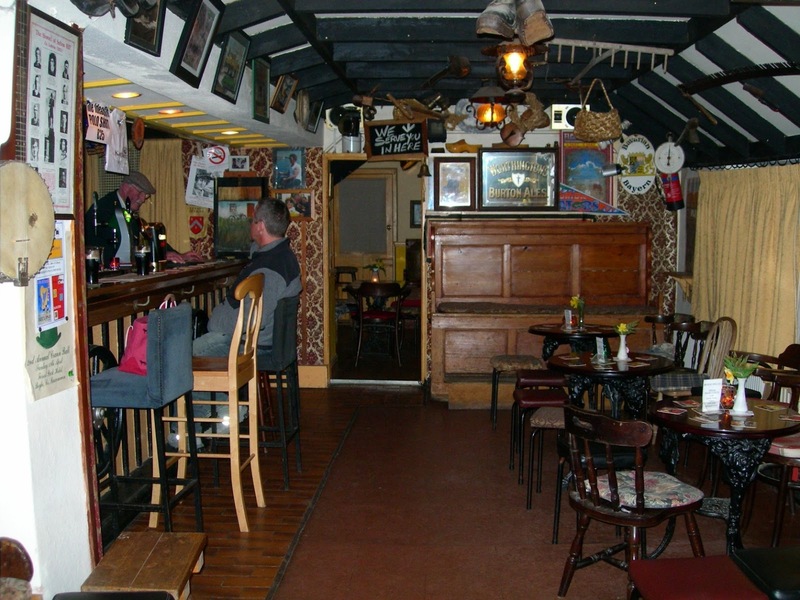 I still hadn't learned that things start later in Ireland (that wouldn't be for a few years more) and so we were the first ones in the pub and the man working the bar that night, Percy (who has since become a very dear friend of mine), had to unlock the door and let us in. I was disappointed that Gene wasn't there (knowing what I know now, this wouldn't phase me in the least and is precisely what I'd expect). When we asked Percy if Gene still owned the pub he said yes. When I asked him if Gene was going to be in that night, he said "I don't know. He's been off for a few days playing golf in Lahinch." My stomach dropped and I was trying hard to not be devastated at the thought that I may not get to see Gene again- or that he may not know that I was taking him up on his invitation six years later after it was extended. Steve and I managed to have a perfectly wonderful time, even with the thought of Gene not being there hanging over our heads (mostly my head- Steve didn't have anything invested in this). Gene did show up at some point before the music started and was really surprised to . I shared a photo from when I met him in Doolin six years earlier, and while he didn't remember (nor did I expect him to), he was blown away that I actually showed up. The music was short, but oh so sweet. Only a few minutes into the night, I knew that this was going to be the location of our 30th birthday and told Gene as much. Given that I had just shown up six years after first meeting him, Gene totally believed me. We met a woman, Evelyn, who owned a B&B across the street and set plans in motion for staying at her B&B when we returned in 2008. We also met her daughter, Aileen, who was really fun to hang out with. After the music stopped, I went to the bathroom and when I came out there was no one left in the pub except for one other woman. When I asked her where everyone was, including my husband, she said "Gene needed help moving a boat. So all the lads are out back." It was well after midnight and I assure you there was no sunlight left for this task. While I may have thought this was crazy then, I most certainly do not now. I hit a drinking wall- I couldn't drink any more, but this man Jim (an older man in his late 60's/early 70's) wanted to keep buying me pints. When I said no thank you but that I'd take a water he said "I'll but you a pint, but I won't get you any water." He wasn't kidding. When we left at 2:30 a.m., the place was still going and we were essentially shamed out of the pub for leaving so early. In looking back at my journal from that night, here's what I had to say: "Last night was a blast! 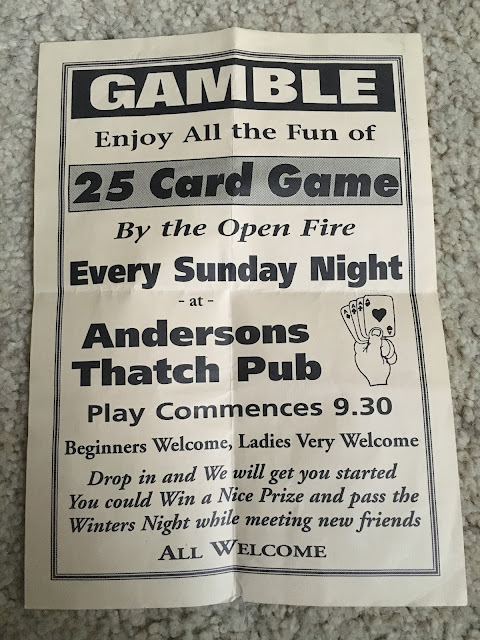 We went to Anderson's Thatch Pub and had what I'm sure will be the best night of our honeymoon. When we got there- about 9:00 p.m. or so, there wasn't anyone else in the place and it didn't really show much promise. The bartender was adorable and friendly to us. Before long, the owner Gene showed up and I showed him the picture I had taken of us six years earlier. By about 10:30 p.m., a handful of musicians had shown up and the night really got started and I was well on my way to getting drunk. I couldn't have been happier. The entire night was fantastic. Gene's an amazing performer. He must have used four or five instruments. And he had a bunch of different people singling too- I was so happy with the night. We met all really nice people and by the end of the night- we finally left at 2:30 a.m.- I was drunk and very happy. It was exactly the kind of night I wanted to experience and I am so glad Steve was with me! It made it that much better." Back together again six years later! Having no other way to communicate with Gene, I sent him a letter and photos from our honeymoon in the late spring/early summer of 2008. I told him how much fun Steve and I had when we were there two years earlier and broke the news that I wasn't kidding when I told him during our last trip that I would be spending my 30th birthday at his pub...if he'd still have us. At this point, there were 15 of us who were planning on traveling over from all corners of the U.S. and I didn't know if he was still up for this. Our birthday would fall on a Thursday, and while I know the music was on Wednesday, I was hoping we could just arrive on Thursday and have whatever celebration unfolded on that night. Part way through July, I received a response from Gene confirming we were on for our birthday celebration. 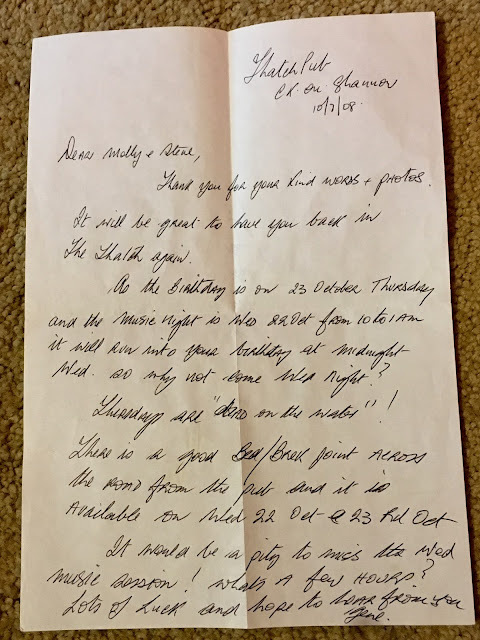 He'd lined up a B&B that some of us could stay at and encouraged us to change our plans ever so slightly and plan on being there on Wednesday night. He was the expert, so we shifted things up by a day and set plans in motion for 16 of us to descend upon his pub in three months' time. For our epic 30th birthday celebration, Katie and I traveled to Ireland with a large group of friends from all over the country: Lynn (who was turning 30 one day after us), her husband Brad and mother Darlene, Meghan, Rob, their/our friends Emily, Keith and Kirstie, my friend Tif and her friend Laurie, Katie's friend Mackenzie (from Michigan) and Jigga and (her then husband) Anthony. Looking back on it, I can't believe that there were 15 of us who managed to make this happen. It was such a special experience and one that I know I'll always look back on with a smile on my face. We had a great night celebrating with new and old friends, with great music, fun stories, dancing, lots of drinks in a pub that is unlike any other place in the world. Here's what I wrote about in my journal "When I walked into the pub and saw Gene for the first time in two+ years, he said "Oh Molly, you're here! You're mad, but you're here!" Meghan took care of a bunch of stuff for us and talked with Gene so that there were some finger foods and a cake waiting for us. 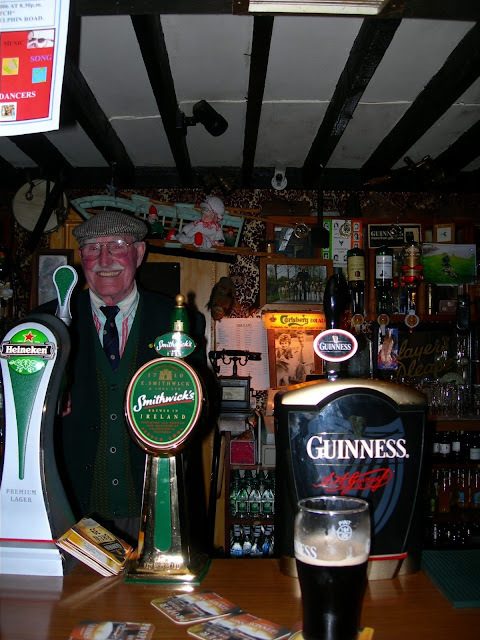 Gene went to great lengths to make the party an amazing night and an authentic Irish experience for us. He had decorated the place and made it even more warm and welcoming than it normally is. 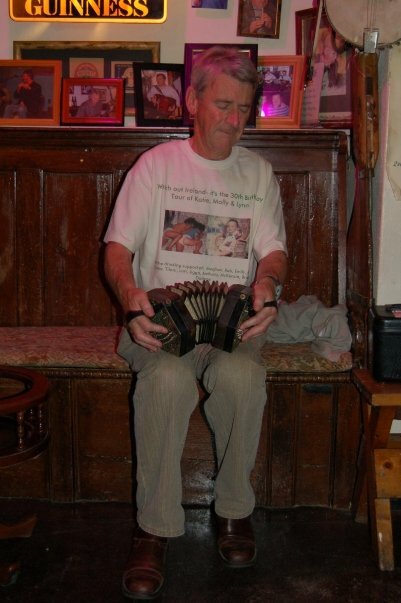 Gene arranged for a guy to come and play music and teach us how to do some Irish dancing. It was so much fun, and funny too. He was so personable and remembered all of our names. He did a remarkable job of ensuring we all had a great time. Gene also had a local, Jim, come up and tell some stories. And then they all played more music. By the end of the night I was getting sad thinking that it was going to be coming to an end. I'd been planning for this night for years. And it was just such a sad idea that it was going to be ending. I was hoping we'd have a similar experience like Steve and I had on our honeymoon where Gene would close the pub to the outside world and let us stay in and drink while he continued to sing and tell stories. But that didn't happen. Gene played one more song before we left and then we thanked him profusely for a wonderful night. He told me he'd make up a bed for me in the house if I came back through town and then we were gone." Our birthday trip was so much fun and getting to share it with so many friends and two of my sisters was really special. I still didn't know how this place was going to become a part of who I was...that wouldn't happen for a few more years. But the bar had been set and I knew I found a place that made me really, really, really happy both times I had been there. I left feeling sad that my time at The Thatch and with Gene was already behind me, but I absolutely knew that I'd be back at some point. After our amazing birthday trip, I began going back to Ireland every year. (One year I even went twice!) I have had two to three weeks every year dedicated to checking out of my "real life" and escaping to a place that truly feels like a second home. 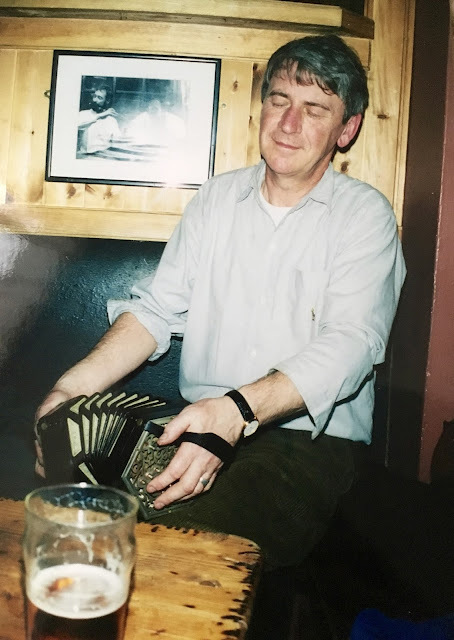 While I've met so many amazing people through this chance encounter with Gene in a pub in Doolin way back in 2000, he is the central character in all of this. Without him, none of this would have happened. Beginning in 2012, I started staying at Gene's and it allowed me to get to know him and Percy more. I got to help out more and spend more time with the both of them, Gene especially. And it allowed our friendship to go more from just hanging out at the pub to having fun adventures together. 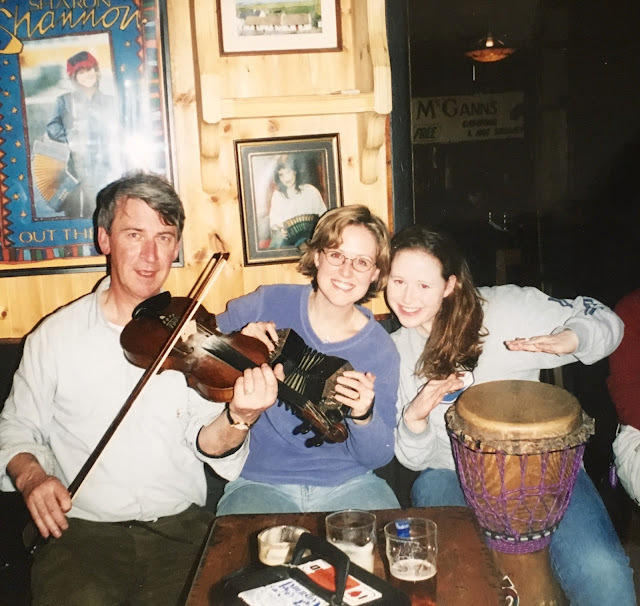 Going to Ireland was so exciting because I didn't know what in the world we'd get into- I just knew that it'd be unpredictable and fun. And that has never changed; in fact, I hope it never does! I'm endlessly grateful to and for Gene and for whatever fate is responsible for our lives intersecting. Because of it, I have something so special and unique in my life in Ireland and in these amazing people who have become so important to me. While I always wish the distance wasn't so great and that I could make it back for more than just once a year, I try very hard to recognize how lucky I am to have something that feels so unmatched in every other aspect of my life. 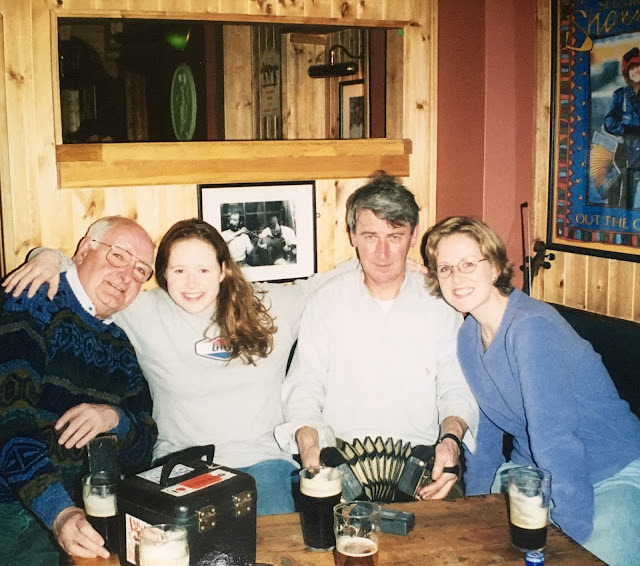 I recognize that Vacation Molly- who is able to leave work, and worries, and real-life struggles behind- can bring the very best of herself to Ireland and it's a very big part of what makes the whole experience as ideal as it is while I'm there. But through Gene I've learned the importance of spontaneity, that it's okay to not plan everything in your life, to have more confidence in myself (thanks for throwing me in the deep end! ), to find the sense of humor in everything you can, to stress less and play more and to just see where the day takes you. While there's a lot of frenetic energy going here, there and everywhere, he somehow has a very grounding presence in my life and I try to let that carry over into my "real life" when I'm not in Ireland. If you have the time or the desire, here is part two. It's a continuation of how my friendship progressed with Gene each year after the 30th birthday bash. It's funny and fascinating to see how it's changed over the years and to read the various adventures I've had because of and with him.